First Citizens of the Treaty City – The Mayors and Mayoralty of Limerick 1197-2007, Matthew Potter. Which Mayor welcomed the first serving US President to Limerick city in a speech which captivated both him and the vast crowd that had turned out to greet him? Or can you name the Mayor who represented Limerick in parliament for nearly half a century? Or the only person to have served as both Mayor of Limerick and Lord Mayor of Dublin? Or what about the Mayor who was born on the Shetlands and died on the shores of the Black Sea while in between leading a rags-to-riches life that included establishing the largest factory in Limerick and giving financial assistance to the Bard of Thomond. The answers to these and many other questions can be found in a major new book on the history of the mayors and mayoralty of Limerick which was launched in Limerick City Hall at 6.30pm on Wednesday 21 November, 2007 by the Minister for the Environment, Heritage and Local Government Mr. John Gormley, TD (who spent much of his youth in Limerick and was a student of St Munchin’s College). First Citizens of the Treaty City is a very detailed and scholarly account of the mayors of the city and shows how their impact has been of crucial importance for over 800 years. It consists of two parts: firstly a history of the office of Mayor from its establishment in the twelfth century to the present day, including a description of the Mayoral chains, robes, civic maces and other regalia and secondly an account of each Mayor of Limerick since 1842, the year that the modern Mayoralty came into existence. The entry on each of the Mayors includes a short biography, an account of the events that occurred during the Mayoralty and where possible a portrait of the Mayor. In this section of the book, we can see what an amazing variety of men and (to date only four) women who have served as first citizen of Limerick. We read about English Mayors, Irish Mayors, Dutch Mayors and even one Scottish Mayor; Mayors who spanned the whole political spectrum from ultra-Conservatives to radical Socialists; Mayors who were authors, soldiers, entrepreneurs, revolutionaries and parliamentarians; a Mayor who wanted to put a statue of Sarsfield on an Arc de Triomphe over Thomond Bridge and a Mayor whose daughter-in-law Kitty O’Shea changed the course of Irish history. The youngest recorded Mayor was 24-year old Thady Coughlan in 1975, while at 70, Michael Quin was one of the oldest persons ever to wear the chain of office in the Treaty City, when he became Mayor in 1848. As a young boy, Matthew Potter had no idea of what he wanted to be when he grew up. Yet all around him, in Donegal town, were clues to what his future would hold. Dotted around his hometown were castles, fortresses and ruins – all remnants of Ireland’s Viking past. Known as the Fort of the Foreigners, Donegal most famously produced Hugh O’Donnell and soon historian and academic Potter could turn his back on the Treaty city and focus on where it all began. His late father, John, who originally hails from Clarina in Limerick, inspired his passion in history. But is was another Viking town, some 200km further down the West coast, that was to become the main source of his academia. Just last week, Dr Potter launched First Citizens of the Treaty City – The Mayors and Mayoralty of Limerick 1197-2007, the product of three years of exhaustive research by the author. It follows on from last year’s publication, The Government and the People of Limerick: The History of Limerick Corporation/City Council 1197-2006, which was the first complete account of the government of an Irish urban area ever written. Now its successor, First Citizens of the Treaty City, represents the first account of the mayors of Limerick and consists of two parts – a history of the mayoralty from the Middle Ages until the present day, and an account of each incumbent since 1842. First Citizens, he recognises, is more of an easy read than its predecessor. Tragic events such as the murder of Mayors O’Callaghan and Clancy in 1921 are discussed, but more lighthearted material, such as the connection of the three O’Mara mayors of Limerick to the Von Trapp family, of Sound of Music fame, makes the heavy material easier to digest. And as the city council, or formerly corporation, celebrates its 810th anniversary in a fortnight, Dr Potter ponders many ‘what if’ scenarios. 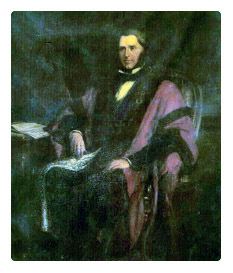 Ambrose Hall, Mayor of Limerick in 1875, instigated the construction and erection of a statue in memory of Patrick Sarsfield, which now lies near St John’s Cathedral. “His original plan was to build something like the Arc de Triomphe in Paris, only something smaller, across Thomond Bridge at King John’s Castle. and on the arch he wanted a statue of Sarsfield, so it would have been incredibly impressive if it was built,” he marvels. When questioned on the most important mayor in Limerick’s 800 year history, he is momentarily dumb-founded. “They all made their contributions in different ways; some of them were extraordinary figures,” he says pausing to reflect on his accounts in the extensive 300 page compilation. “Maurice Lenihan was probably one of the most extraordinary mayors. He was a very interesting character, because he came from Waterford and wrote his most fantastic book on the history of Limerick. On 23 June 2006, at a special meeting of Limerick City Council held in St. Mary’s Cathedral, Limerick to mark the 350th anniversary of the restoration of Limerick Corporation, (which had been abolished by Cromwell in 1651) , Dr. Matthew Potter’s book, entitled The Government and the People of Limerick. The History of Limerick Corporation/ City Council 1197-2006) was launched by the Minister for Defence, Mr. Willie O’Dea TD. This book, which had been specially commissioned by Limerick City Council, is the first scholarly account of the entire history of an Irish municipal authority ever written. It is more than the history of the local authority; it is a virtual history of Limerick City itself- the first such major work since Lenihan’s History of Limerick which was published 140 years ago in 1866. The title of the book is taken from the motto of the ancient Roman Empire and the modern city of Rome, which is SPQR, the acronym for ‘Senatus Populusque Romanus’. This may be translated as ‘the senate and the people of Rome’ and is very applicable to the present book, which is a history of both the local government system and the people of Limerick City. The book deals with the major milestones in the city’s municipal history including the first charter (1197), the establishment of the Reformed Corporation (1841) and the introduction of the management system (1934). However it is also the history of an institution that changed, adapted, developed, survived and flourished during many turbulent centuries of our nation’s history. It is also the chronicle of how the local authority impacted on the lives of the people of Limerick and how it helped shape the physical, social, political and cultural life of the city. Among the topics to be covered are the successive Town and City Halls, the development of the city regalia, Mayoral chains, civic robes and other municipal treasures. Dr. Potter has divided the eight hundred year history of local government in Limerick city into what he calls ‘the two ages of Limerick Corporation’. During the First Age (1197-1841), Limerick Corporation was an all-purpose local authority, which provided virtually all services, acted as local regulator and was the sole agent of central government. Central government had very few functions. The Corporation ran the city’s economy and legal system and provided the police and prison service. It organised the defence of the city and was responsible for building and maintaining the huge wall that encircled Limerick for many centuries. In those days, the Mayor of Limerick was like a local King, who was the actual ruler and administrator of the city (there was no City Manager until 1934). Limerick’s constitution was provided by 12 charters issued between 1197 and 1609. One of the most fascinating insights to emerge from his account of this period is that Limerick city was a virtually independent state for nearly 200 years from 1413 to 1603, like the modern city-states of Singapore and Dubai. Limerick even went to war with Galway in 1524 but the result was a draw! The Second Age (1841 to the present) saw the evolution of the modern local authority, which changed its name to Limerick City Council in 2002. While not as powerful as its Medieval predecessor, the modern City Council provides a host of services to the City, from social housing to libraries and from water supply to playing fields. It is still the most important agency in Limerick City. Such a comprehensive book (it runs to some 600 pages) is a pioneering work of national as well as local importance and will be a definitive work for many years to come. It costs 45 euro (hardback) and 25 euro (paperback) and can be bought in Limerick City Library and in all bookshops in Limerick city and its environs. Matthew Potter was born in Donegal Town but has lived in Limerick for over thirty years, first in Clarina, from where his family hailed, and later in Limerick city. He graduated from the University of London with a first class honours degree in history in 1989 and from NUI Galway in 2002 with a Ph.D in history. Having worked for Limerick City Council for many years, he has recently been appointed to the staff of the History Department in the University of Limerick. His first book, a biography of William Monsell of Tervoe, was published in 1994. Matthew is married to Colette and they have two children, Alex (11) and Anna (9) and live in Dooradoyle. When not working in the field of history, Matthew’s hobbies are classical music and opera, art and architecture, travel, reading and Toastmasters. He is a member of Raheen Toastmasters Club.